Same Great Foam Tac formula in a easy to use, easy to carry and easy to dispense 5ML each tubes with precision tip. Perfect for carrying to the field for repairs!!!! FOAM-TAC’S improved formula now contains UV blockers so that it can be used in the field in direct sunlight without any yellowing or degrading. They have also added a special adhesion promoter to make the glue even stronger and more durable than before. 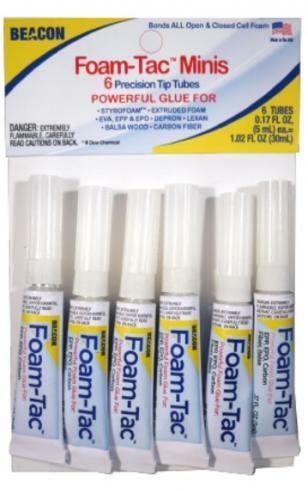 FOAM-TAC offers many advantages over other types of glues that have been used on R/C planes. Since a little Foam-Tac goes a long way, you’ll build Drone after Whoover with one tube, saving time, money and materials. Works on ALL types of foam including Depron, EPP, EPO, Styrofoam, insulating foam, and even florist’s foam, as well as with balsa wood and carbon fibre. Note : Not for sale to persons under the age of 18. By placing an order for this product, you declare that you are 18 years of age or over. This item must be used responsibly and appropriately.